Kristin from Formerly Wiphey pointed out that a Blackberry 8800 is coming out for T-Mobile in April. I checked the info with my T-Mobile rep and Kristin is correct. 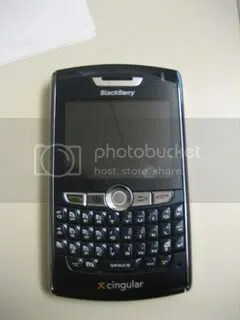 The new T-Mobile Blackberry 8800 is to be named the Blackberry Crimson 8800. This tip came from my T-Mobile rep who pointed me to the BB Hub website. The Crimson looks like a slick device. It’s bigger than the Pearl, and has all the new Blackberry features (camera, video, media card, etc.). It appears that the source for all of this info is The Boy Genius Report so make sure to check them out. Life has weird ways of sending messages sometimes and this is one of those times. I posted something about the Blackberry 8800 a few days ago. 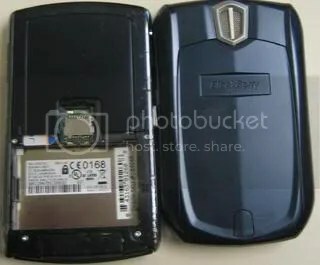 The very next day I get a call from my Network Admin saying that he found a Cingular Blackberry 8800 laying on 6th Ave. (NYC). He asked if he should bring it up to the office. I said YES!!! I wanted to check it out and possibly return it to it’s owner. Update: The Blackberry 8800 is NOT the Blackberry Crimson. It’s a neat looking device. It’s slightly smaller and lighter than the 8700g. You can see that the 8800 has been run over by a car (or two). The 8800 is the 8700 with a trackball, video, camera, and better dimensions. I hate to say it, but I can’t wait to see the Crimson. This entry was posted in Blackberry. Bookmark the permalink. I’m still antsy to see if its going to have wifi. I REALLY want it to have wifi!! !